This birthday Cake was made for a 6 year old boy called Andreas. The idea came from Debbie Browns' Book "50 Easy Party Cakes", which I find a very good source for birthday cake ideas. The design was a bit different than mine. For a birthday cake in this size I think my version looks better...! The main castle had a diameter of 21cm x 21cm and the height was about 16cm. My kids were very excited with this birthday cake, so I think I will make something similar for my boys when they will have their birthday party. The cake was made with butter, cacao, powder sugar, eggs, biscuits, vanilla essence and brandy. 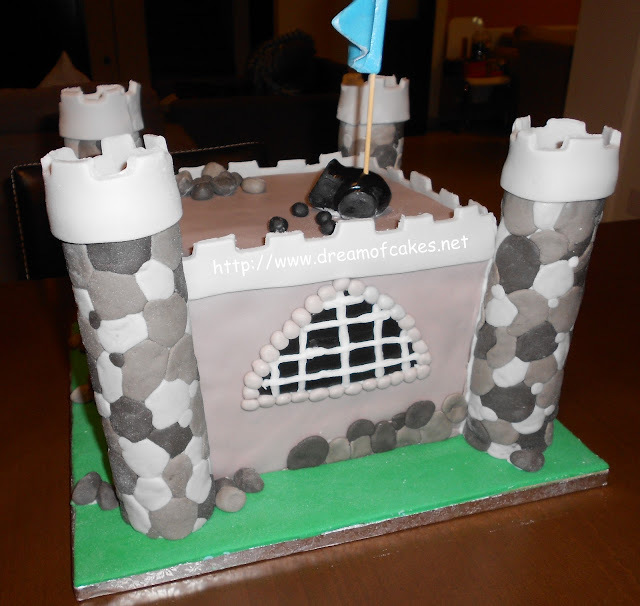 The castle towers were made with round cardboard covered with fondant. The flag was made with gumpaste. This is a rear view of the cake. You have such talent. I love that cake and I'm sure anyone would. Beautiful work! Efti you are so talented. Your kids are the best judges for your work and seeing kids excited is only a good sign. Keep it up! This is so cute! It must of taken a lot of work. Respect! Oh, wow! That is great, the stone towers are so cool! You never cease to amaze me with your wonderful cakes and your great creativity. Oh, dear! It is a beautiful work! That is so cute that your boys got excited over this cake. What a good mom you are to make it for them when it's their turn. :) Hugs! Wow - the stone wall is amazing and - I imagine - a TON of work! Bravo - another beautiful cake! And you've done it again! Super impressive! Very impressive cake. I love how you did the stonework on this. Your passion clearly shines through on this one. 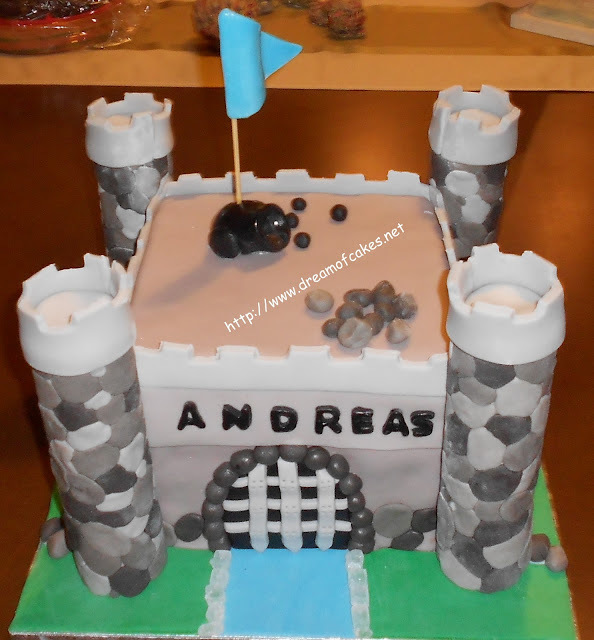 I am sure that Andreas will not easily forget this awesome cake. Amazing work! Great looking cake. That is one lucky Birthday Boy! WOW what an amazing Cake - my nephews would absolutely die over this cake if they had it for their Birthday! O-M-G!! You are so creative! The cake looks amazing! This is a work of art! The stonewalls look so real! Amazing the knights really top it off. 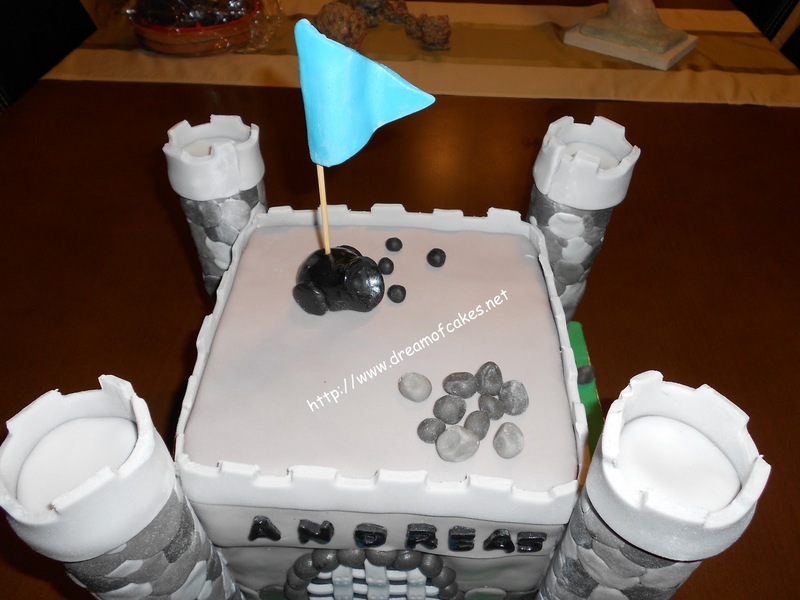 Do you mind if I ask, when you made the turrets, did you wrap the cardboard in fondant and then layer on the stone effect, or did you just put the stone effects straight onto the cardboard? Did you not find that the cardboard when soggy at all? 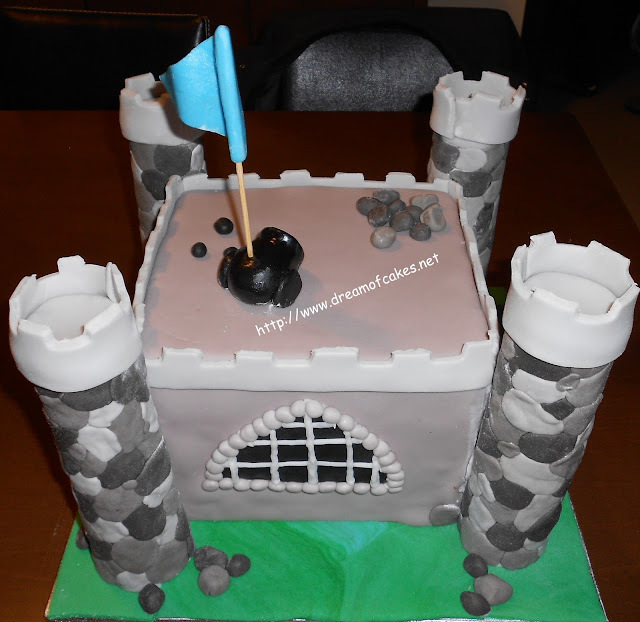 Hi, The cardboard I used to make the turrets was covered with cling film and then with the fondant you see in the photo. I used vodka to stick the "stones" together, and I tried to put each "stone" close to the other. If you use fondant instead of cling film, you will make the construction heavy and you will have a problem. It will fall apart. That's great, thanks! I assume you left the cardboard inside the turrets as well for support? I've seen some where the tubes are used to make a hollow turret using flower/modelling paste and then the cardboard is removed, but i can't imagine they are very stable. Yes I kept the cardboard. You can keep them for future use as well. All you have to do is keep the turrets well wrapped with cling film in a dark place. Can I have your name please? Great thanks for your help! It's a brilliant cake. My names Claire, I've been asked to make a boys castle cake for someone I work with, and i've been debating with myself all evening about the best way to make some turrets! Good luck Claire! It took me more than 7 hours to finish decorating this cake and I had help as well. Organize your time accordingly... Please let me know of the result. I would love to see a photo of your finished cake!